HESPERIA, Calif. - Chard Walker, best known as an operator at the Santa Fe train order station at Summit, Calif. in Cajon Pass, died at 8:10 this morning after a brief illness. He was 85 years old. More than just another operator, Walker became Summit's unofficial photographer and chronicler during his 16-year tour-of-duty at what was once considered the middle of nowhere, documenting every train movement he could, not only of his employer Santa Fe but the Union Pacific, which used Cajon Pass via trackage rights. 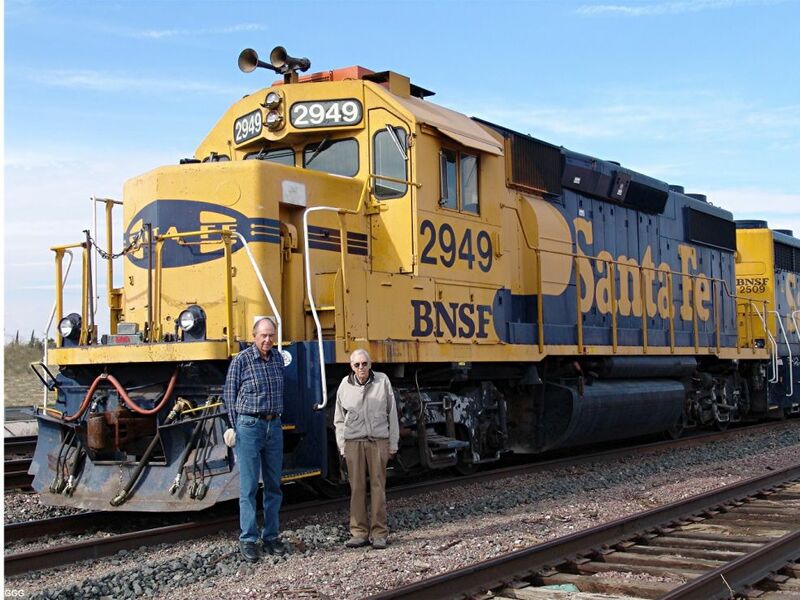 Over the years he captured the entire fleet of Santa Fe and UP passenger trains that crested Summit, detouring Southern Pacific trains due to a derailment on the SP's Sunset Route, wrecks, steam and diesel helpers, and his home life, all with the advantage of being able to be in the know and on the spot. A fan, Walker was friendly with those who came to watch and photograph trains in the area and his list of visitors included Richard Steinheimer, Don Sims, and Robert Hale, among the hundreds who would just stop in, say hello, and get an update on when the next train was coming. Whenever he could, Walker was happy to oblige. His photographs often appeared in Trains, which featured a two-part study on him in his own words in the January and February 2004 issues. Walker hired out on the Santa Fe June 20, 1947, as a night clerk at the Victorville, Calif., station, primarily loading and unloading mailbags and express packages from trains calling there between 10 p.m. and 7 a.m. In between, he acted as the station janitor. He qualified as a train-order operator with a seniority date of Sept. 5, 1947, and became a full-time relief operator at Summit in 1951. He stayed until the position was terminated Feb. 12, 1967. At its peak, Summit consisted of a post office, a few railway maintenance buildings, and company homes, one of which Walker occupied with his wife Margaret and his two children. Walker started at Summit as the fourth operator - relieving the station agent and other operators. His routine was two day shifts as agent, then two swing shifts for the second-trick operator, then two days off, and finally a graveyard shift for the third trick. The "agent" title gave him a nickel more per hour in his pay envelope. As his years and seniority increased, Walker settled into what would become his favorite shift; 4 p.m.-to-midnight. After leaving Summit, he moved to a night job in the San Bernardino, Calif., dispatcher's office. Later, he moved over to a tower job at the sprawling Barstow, Calif., classification yard. Walker "pulled the pin" June 9, 1983, and retired to Hesperia, Calif., near Victorville. Among his best memories at Summit was living in the Descanso, a former Los Angeles Railway streetcar last used as a funeral car. He lived there, at first without lighting and heat generated only by a wood stove, for eight years until he married in 1955. Eventually the railway moved a company house up to Summit for him and his new bride. Walker is survived by his two daughters, Judy and Joy. The family of Chard Walker wishes to extend our heartfelt appreciation for all the cards, phone calls, condolences posted on the web, and your thoughts and prayers. Thank you to all of you who were able to attend his memorial service and share with us in the celebration of his life. A special thanks also to those of you who visited Dad in his final days and sent cards and telephoned him. He truly treasured all of his friends and after he lost our Mom he always kept us posted on who had visited him or called him that week. He always said "That's what keeps me going". After meeting many of you the last few weeks we know why he treasured you so. Our Dad will never be forgotten. We will remember him every time we see a train or a trolley, hear a pipe organ, or see the moon. We will always remember how much he loved those things. And we will always remember our magical life at his beloved Summit. He's back home again at Summit now – with Margaret, Duke and the Descanso. Just the way we remember it.